Today, I rise on a personal and collective privilege to speak on a very important issue that has earned the ire of many human rights victims of the Martial Law regime: President Aquino’s February 13 appointment of a former police general as chair of the Human Rights Victims’ Claims Board. Mr. Speaker, the said appointment is an insensitive act on the part of President Aquino — even a dishonor to the memory and sacrifices made by the victims of Martial Law. Mr. Speaker, my dear colleagues: the Martial Law victims waited for nearly three (3) decades after the late dictator was ousted before Republic Act No. 10368 or the Human Rights Reparations and Recognition Act was passed into law last year. They were made to wait again for another year before Pres. Aquino finally constituted the Claims Board. However, other than it was an insult to the victims, the appointment of Police General Lina Castillo-Sarmiento as chair of the claims board is also a highly questionable act. (d) Must have a clear and adequate understanding and commitment to human rights protection, promotion and advocacy. Indeed, what really was the involvement of Director Sarmiento in preventing human rights violations during the Martial Law regime? Mr. Speaker, President Aquino cannot feign ignorance of the requirements of the very law that he signed last year. Callously, instead of appointing as head of the claims’ board a victim or even a representative of the victims, Pres. Aquino choose to give this rare distinction to a representative of the very institution – the Philippine Constabulary, the forerunner of the PNP — that unleashed, along with the AFP, the most brutal human rights violations during the Marcos dictatorship. During the previous Arroyo administration, Director Sarmiento was one of its apologistsasthe former Director of the PNP Human Rights Affairs Office (HRAO). As HRAO chief, she merely swept under the rug charges of human rights violations committed by PNP officers and personnel. She was part of the “denial machine” that attempted to deodorize the stench of the internationally condemned cases of extra-judicial killings and enforced disappearances under the Arroyo administration. One such case in the past was the manner by which she handled the investigation involving the case of 32-year-old Renante Romagus, a farmer, who had survived from his ordeal after he was forcibly abducted, tortured, held in captivity, repeatedly stabbed and left for dead last December 12, 2007 in Compostela Valley Province, in Mindanao. According to the Hong Kong-based Asian Human Rights Commission (AHRC), Director Sarmiento, as head of PNP HRAO, dismissed calls for investigations on Romagus case, as she lamely but callously blamed instead the victim’s inability to identify his perpetrators. Again, we asked General Sarmiento, where were you and what did you do as head of HRAO during the height of the state of impunity involving cases of EJKs and Enforced Disappearance under the Arroyo administration? Last year, during the AFP-MNLF Zamboanga City standoff, the only claim to fame of Director Sarmiento was her program of bringing in clowns and comedians to entertain the affected residents, but, she was very silent on the reported torture and other human rights violations committed against civilians and suspected MNLF rebels. Yes, Mr. Speaker, even until today, the very institution that Director Sarmiento represents is associated in many more serious cases of human rights violations. For example, just last month, several PNP personnel were exposed to have been involved in maintaining a torture chamber in Laguna. On the other hand, it is also appalling to note Mr. Speaker, distinguished colleagues, that after a year of dilly-dallying the appointment of the claims board, President Aquino even bypassed and disregarded nominees from SELDA or the Samahan ng Ex-Detainees Laban sa Detensyon at Aresto, an organization of former political prisoners and victims of Martial Law. SELDA is one of the human rights organizations specifically recognized by RA 10368 to submit nominees to be appointed as members of the claims board. Mr. Speaker as we closely monitor the actions of this Aquino claims board, I challenged this Chamber, which made possible the passage into law of RA 10368, not to allow President Aquino to desecrate further the said law, even as we continue to fight for justice for the victims of Martial Law and for all the victims of human rights violations. Thank you, my dear colleagues. MANILA, Philippines — The bicameral conference committee on human rights compensation bill for victims during the Marcos regime has approved the creation of a compensation board which will evaluate claims. 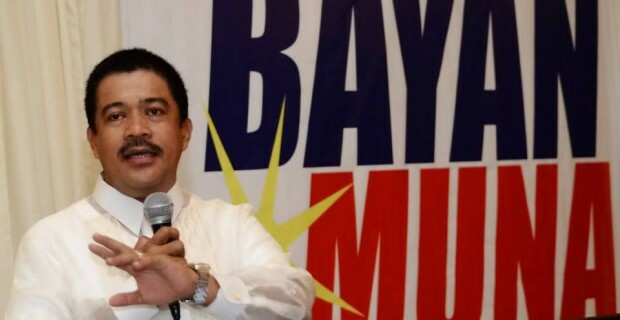 Bayan Muna Partylist Representative Neri Colmenares on Wednesday said that the members of the panel were now discussing the qualifications of the members of the board. 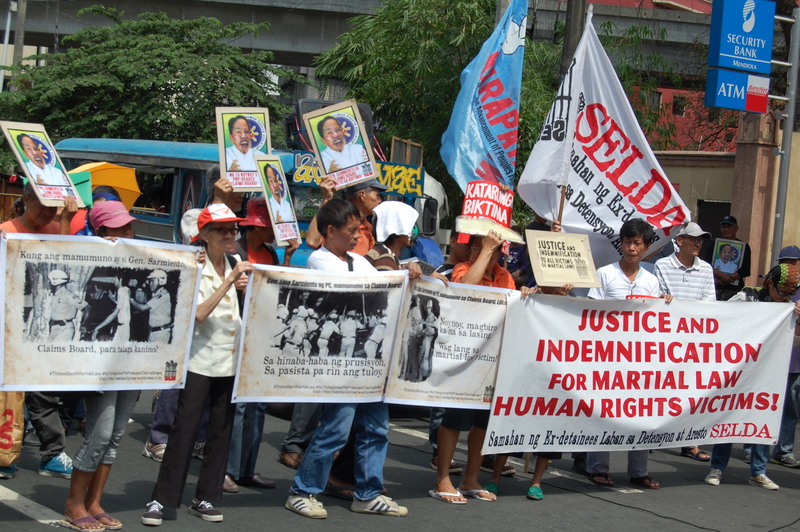 Senate Bill 3334 proposed that the compensation board scrutinized claims for compensation by martial law victims. The panel is presently in talks to resolve contentious issues on SB 3334 and House Bill 5990, which seeks to include 9,539 human rights victims who were part of a prior complaint adjudged by the US Federal Court System in Hawaii. The Senate version also requires evidence of human rights violations against the martial law victims. This goes against the House position, led by the principal author of its version Deputy Speaker Lorenzo Tanada III, which seeks to acknowledge the Hawaii plaintiffs as victims during the Marcos regime without requiring evidence.